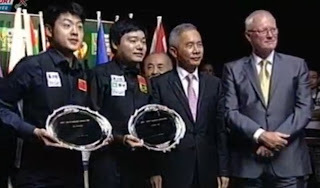 Northern Ireland and China are the finalists of PTT-EGAT Snooker World Cup! China took the world today, beating Northern Ireland by 4-2. The first frame is between two captains of the teams, Ding Junhui and Mark Allen. Ding firstly made 37 and 84 is added afterwards to take the frame. Gerard Greene from Northern Ireland is frozen again as Liang Wenbo had a first chance in the second frame. China won the second quickfire to lead 2-0. Here comes the doubles! China got a chance after Northern Ireland had the balls running out of position. The break stopped at 46 and safeties followed. Allen made a mistake in the safety, Chinese boys cleared the table to lead 3-0. Ding and Liang had a big smile on their face after this frame! Huge frame for Northern Ireland is coming up. Greene made 109 to trail 1-3 on China. The next singles is between Mark Allen and Liang Wenbo. Liang ended at 55 by missing the tricky pink, there were hopes for Allen. Allen made 69 and passed the winning line. 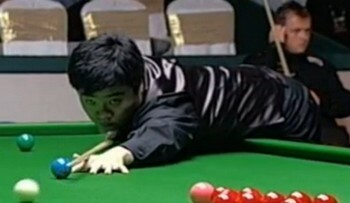 Liang tried to make snooker but later was forced to concede. Both teams were nervous in the second doubles frame. But Ding grabbed the chance to make 89! 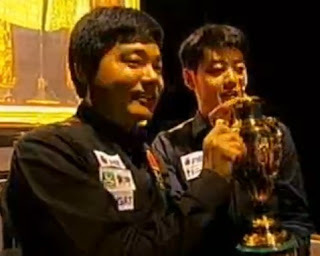 Well done to Ding Junhui and Liang Wenbo! China won PTT-EGAT Snooker World Cup by beaten Northern Ireland 4-2. Congrats! One of the reasons why Northern Ireland struggled early in the match is that their semi-finals against Hong Kong took too long. It spent over 3 hours that costed the boys pretty much physical vigor. Mark Allen even closed his eyes when he was not playing! The boys were too tired to play the final after semi-finals in 2 hours... It is not fair for the team who plays the second semi-finals. I believe the match schedule can be improved! Good luck to Ding Junhui and Liang Wenbo!